In the late 19th century, it was called “the typically American” region by Frederick Jackson Turner. Religious pluralism and ethnic diversity have been important elements of Mid-Atlantic society from its settlement by Dutch, Swedes, English Catholics, and Quakers through to the period of British rule, and beyond to the current day. 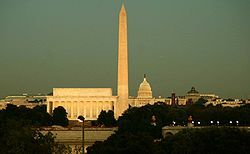 After the American Revolution, the Mid-Atlantic region hosted each of the historic capitals of the United States, including the current federal capital, Washington, D.C. 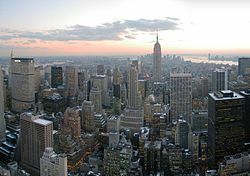 In the early part of the 19th century, New York and Pennsylvania overtook Virginia as the most populous states and the New England states as the country’s most important trading and industrial centers. Large numbers of German, Irish, Italian, Jewish, Polish, and other immigrants transformed the region, especially coastal cities such as New York City, Newark, Philadelphia, Baltimore, and Washington, D.C., but also interior cities such as Pittsburgh, Rochester, Albany, and Buffalo. The Northeast Corridor and Interstate 95 link an almost contiguous sprawl of suburbs and large and small cities, forming the Mid-Atlantic portion of the Northeast megalopolis, one of the world’s most important concentrations of finance, media, communications, education, medicine, and technology. Virginia and especially West Virginia, are atypical of this region in a few ways. They are the only states to lie primarily within the Southern American dialect region, and the major religious tradition in both states is Evangelical Christian, 31% in Virginia and 36% in West Virginia. Although a few of West Virginia’s eastern panhandle counties are considered part of the Washington, D.C. MSA, the major portion of the state is rural, and there are no major or even large cities. While early settlers were mostly farmers, traders, and fishermen, the Mid-Atlantic states provided the young United States with heavy industry and served as the “melting pot” of new immigrants from Europe. Cities grew along major ports, shipping routes, and waterways. 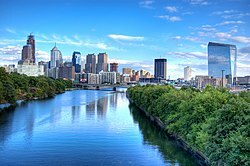 Such flourishing cities included New York City and Newark on opposite sides of the Hudson River, Philadelphia on the Delaware River, and Baltimore on the Chesapeake Bay. Note: The Mid-Atlantic region is also home to the nation’s capital, Washington, D.C..
^ “State & County QuickFacts”. US Census Bureau. Retrieved 2009-04-09. ^ “News Release: GDP by State” (PDF). Bureau of Economic Analysis. Retrieved 2009-04-16. 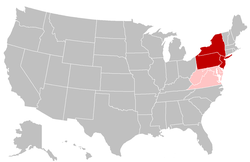 ^ “Middle Atlantic states – region, United States”. Britannica.com. Retrieved 2 November 2017. ^ “United States”. Encyclopædia Britannica. 2009. Retrieved 2009-04-09. ^ “National University Rankings”. U.S. News & World Report. Retrieved December 28, 2018. ^ “Best Global Universities Rankings”. U.S. News & World Report. Retrieved December 28, 2018. ^ Earl A. Greene et al. “Ground-Water Vulnerability to Nitrate Contamination in the Mid-Atlantic Region”. USGS Fact Sheet FS 2004-3067. 2005. Retrieved 25 April 2013.Note: Although the locator map appears to exclude part of northwestern Pennsylvania, other more detailed maps in this article include all of the state. ^ “Merriam-Webster”. Merriam-webster.com. Retrieved 2017-08-30. ^ Earl A. Greene et al. “Ground-Water Vulnerability to Nitrate Contamination in the Mid-Atlantic Region”. USGS Fact Sheet FS 2004-3067. 2005. Retrieved 25 April 2013. Note: Although the locator map appears to exclude part of northwestern Pennsylvania, other more detailed maps in this article include all of the state. Often when discussing climate, southern Connecticut is included with the Middle Atlantic. ^ “Word Net Definition”. Wordnetweb.princeton.edu. Retrieved 2009-04-09. ^ “Religious Landscape Study”. Religions.pewforum.org. 11 May 2015. Retrieved 2 November 2017. ^ “U.S. Census 2000 Report” (PDF). Census.gov. Retrieved 2 November 2017. Bodle, Wayne, “The Mid-Atlantic and the American Revolution”, Pennsylvania History 82 (Summer 2015), 282–99. Heineman, Kenneth J., “The Only Things You Will Find in the Middle of the Road are Double Yellow Lines, Dead Frogs, and Electoral Leverage: Mid-Atlantic Political Culture and Influence across the Centuries”, Pennsylvania History, 82 (Summer 2015), 300–13. Longhurst, James. “” Typically American”: Trends in the History of Environmental Politics and Policy in the Mid-Atlantic Region.” Pennsylvania History: A Journal of Mid-Atlantic Studies 79.4 (2012): 409-427. Magoc, Chris J., “In Search of a Useable—and Hopeful—Environmental Narrative in the Mid-Atlantic”, Pennsylvania History, 82 (Summer 2015), 314–28. Mancall, Peter C., Joshua L. Rosenbloom, and Thomas Weiss. “Exports from the Colonies and States of the Middle Atlantic Region 1720–1800.” Research in Economic History 29 (2013): 257-305. Richter, Daniel K, “Mid-Atlantic Colonies, R.I.P.”, Pennsylvania History, 82 (Summer 2015), 257–81. Rosenbloom, Joshua L., and Thomas Weiss. “Economic growth in the Mid-Atlantic region: Conjectural estimates for 1720 to 1800.” Explorations in Economic History 51 (2014): 41-59.